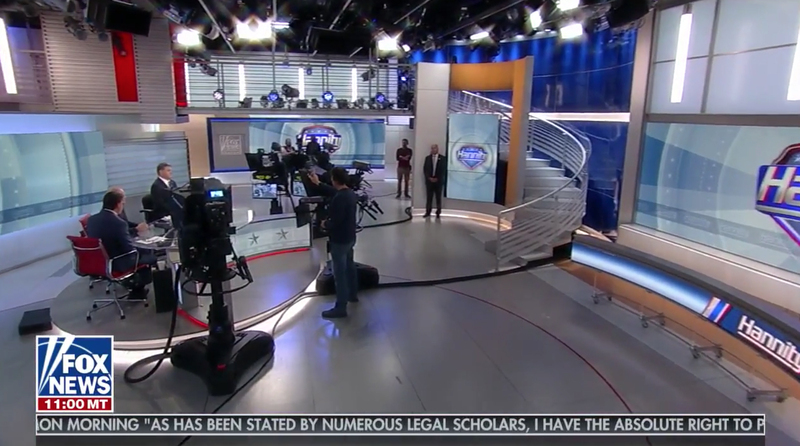 Fox News’ Sean Hannity’s eponymous show became the network’s first show to broadcast from the revamped Studio J, as first reported by NewscastStudio, with design by Clickspring Design. 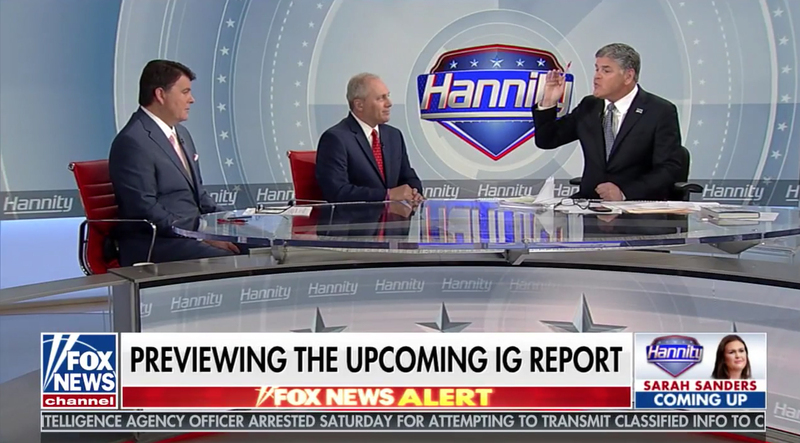 During the toss between Tucker Carlson in the network’s Washington, D.C.’s studios and Hannity in New York, the pair mentioned Hannity’s new digs. 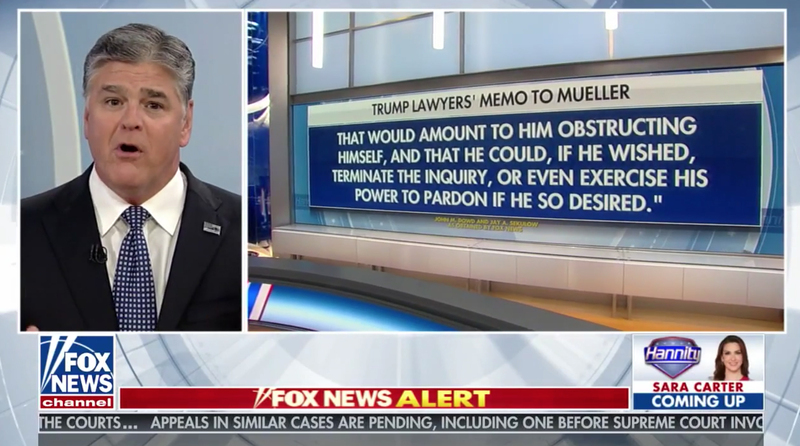 Next, the show’s theme music and title card appeared followed by two sweeping wide shots of the new studio — before cutting to Hannity’s one shot. 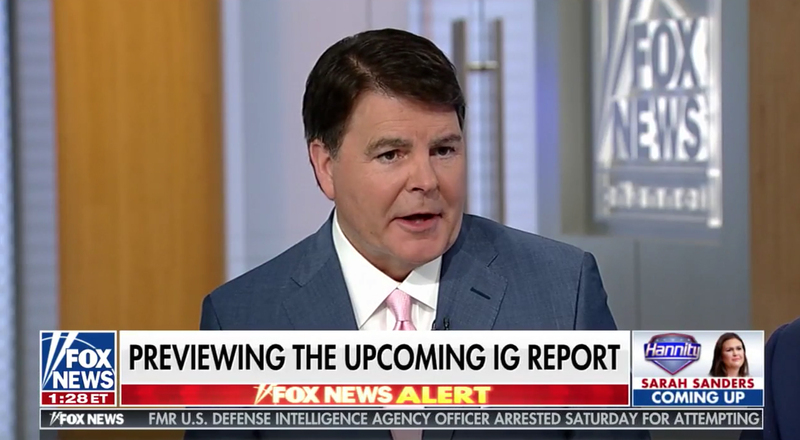 “Kind of like Shep’s spaceship newsroom,” commented Hannity before launching into his show, referencing Shepard Smith’s “Fox News Deck” set, which was also designed by Clickspring. 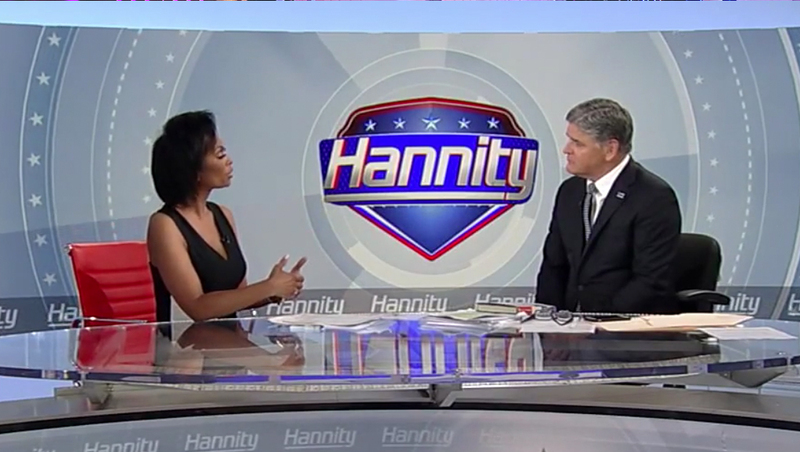 The pale blue looping background behind Hannity has been updated to feature a ring and star motif, the glossy 3D version of the show logo and a frosted version of the logo running along the bottom of the video wall. 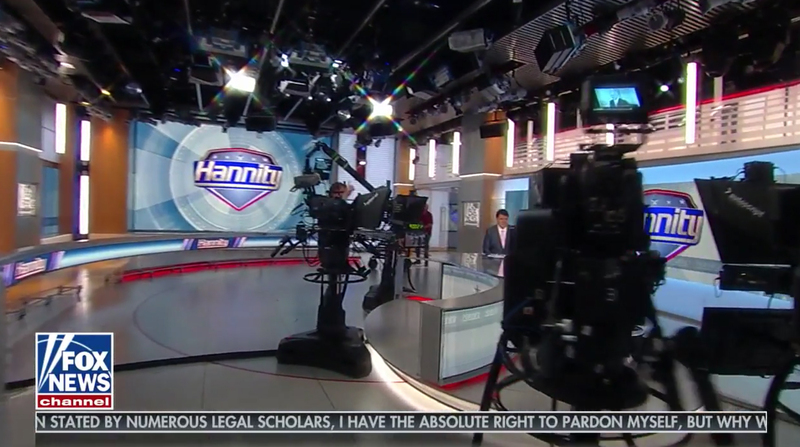 The 3D stars, which were on the video wall background in Studio F, have moved to the curved pivoting LED band in front of Hannity’s desk — which also features the same pale blue motif and frosty logo look. 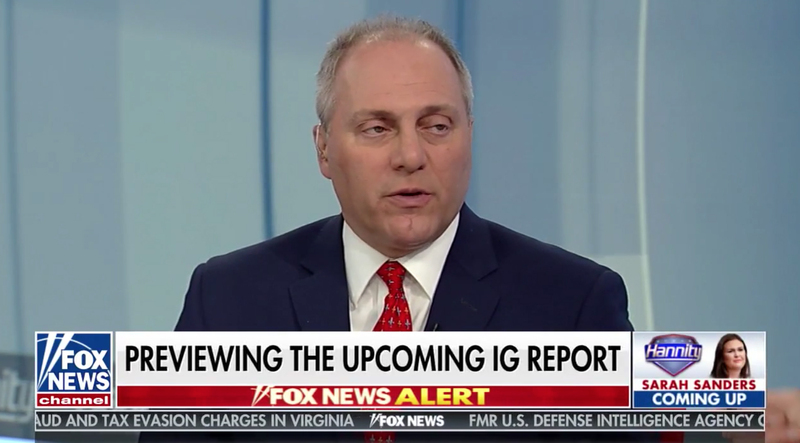 During interview segments, Hannity’s one shot switches to a horizontal banded background that features pale versions of his logo and a matching color scheme. 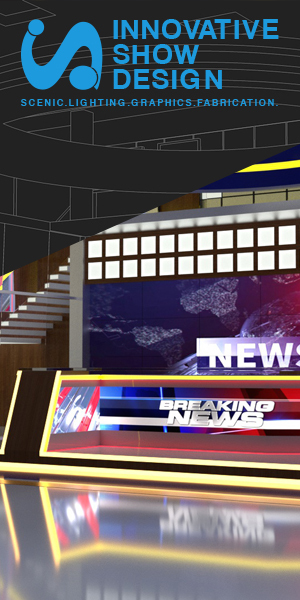 In some angles, one of the studio’s dimensional Fox News Channel logos is visible. On the opposite side of the desk, another dimensional logo is visible along with the studio’s functional glass doors and light wood tones visible. Other guests, meanwhile, are set against the same pale blue video wall background. 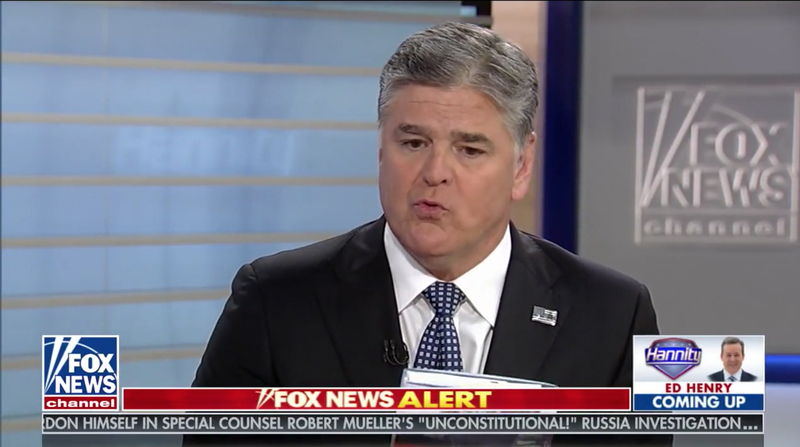 The studio’s plethora of video walls, including the floor to ceiling one on one of the set and movable curved LED ribbon opposite Hannity’s home base are also fed matching “Hannity” graphics. The video will behind this ribbon is also used to display quotes and other topical graphics. Studio J was designed by Clickspring Design with fabrication by Mystic Scenic Studios. Leyard provided the studio’s display technology with lighting from The Lighting Design Group.